The second verse of Proverbs clearly explains the purpose of this book in the Bible: “To know wisdom and instruction” (Prov. 1:2). But unfortunately, the principles found in Proverbs are really missing in our culture today. We no longer deal with the issues of the heart. It’s all about our emotions - how we feel. For many of us, life is about making money and taking care of ourselves. We want to live easy lives and have all kinds of luxuries, but we neglect matters of the heart. There are people today who, on a heart level, are babies. They’ve never grown up. They don’t understand the importance of guarding their hearts. But the Bible explains why we should pay close attention to this. I’ve been to places where people are severely poor, yet they are happier and have better things going for them than people who are a million times richer. Why is that? It’s simply because their heart issues are right. On the other hand, there are people who have a lot of fame, which some may think would make them happy, but their hearts are wrong. So many movie stars and athletes who make millions and millions of dollars and have so much acclaim are typically miserable because their hearts aren’t right. These kinds of people don’t embrace the things of God. They live in open rebellion to all the standards that God’s Word teaches. They reject His truths and do things their own way. They have become a god unto themselves. They are so popular and so rich that they just do whatever they want, yet they’re miserable. They can’t keep their marriages together, or they don’t bother getting married because they’re afraid of commitment. They have children out of wedlock. Many are on drugs and end up dying from drug overdoses. All this could be avoided if they’d allow God to deal with their hearts. The heart is more important than the kind of car a person drives, the house they live in - all of these things. We need to put the emphasis on the heart; that’s where the issues of life come from. Proverbs also tells us that “as [a man] thinketh in his heart, so is he” (Prov. 23:7, brackets added). So, it’s important to see that whatever situation we find ourselves in, it’s because we thought that way in our hearts. We may not have thought, I want to have this failure. Of course not. But we thought in ways that made us identify with failure and made us feel inadequate to overcome it; therefore, we allowed it to happen. Either we occasioned it by our thoughts, or our thoughts allowed Satan to push it over on us because we didn’t know our identity or our authority in Christ. The truth is, God is the one who gives us the authority to resist the devil and overcome. Most people today believe that they can’t control how they think or feel. They think that because someone did something to them or they got sick or whatever, they can’t control how they feel. If that were the case, then Jesus was unjust to give the command, “Let not your heart be troubled” (John 14:1). The night before Jesus was crucified, His disciples, who loved Him and gave up everything for Him, were about to see Him rejected and killed. Yet Jesus told them to not let their hearts be troubled. Today’s Christians would say, “That’s unreasonable. We can’t do that. We’re only human.” But that’s what Jesus told His disciples. I believe the heart is the combination of the soul and spirit. Originally, God created the physical body of Adam, but he wasn’t alive until God breathed into him the breath of life (Gen. 2:7). That is when God imparted His Spirit into man and man became a living soul. That is to say, Adam received a life-giving spirit from God, and the soul came into existence as a buffer between the spirit and body. The soul and spirit together compose the innermost part of man, and it’s what is being referred to here. The Message translates Proverbs 4:23 as “Keep vigilant watch over your heart; that’s where life starts.” The Living Bible says, “Above all else, guard your affections. For they influence everything else in your life.” Because your heart is where life starts and it influences everything else in your life, you really shouldn’t let your heart be troubled (John 14:1). The born-again spirit has the mind of Christ (1 Cor. 2:16) and knows all things (1 John 2:20). The victory in our Christian lives comes when we believe with our whole hearts. As Christians, our born-again spirits are always believing, so we have to get our souls, or mind and emotions, in agreement with our spirits. I only have a small amount of space here to share from the book of Proverbs. 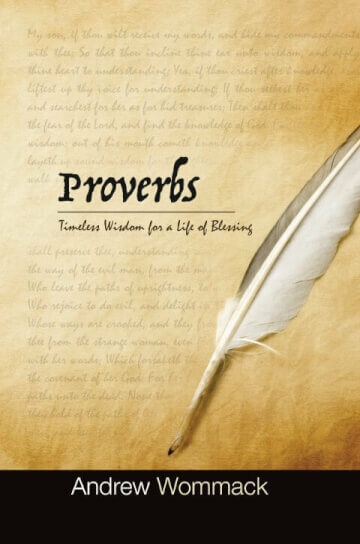 But my newest teaching, Proverbs: Timeless Wisdom for a Life of Blessing, is an in-depth, verseby- verse study of all thirty-one chapters! This teaching covers topics like character, business, wealth, child-rearing, and politics. It will give you practical answers to help you in everyday life. The hardcover book is over 800 pages and includes notes from my Living Commentary. The book is part of two special Proverbs packages we have put together. With the Gift Set Package, you can dive into Proverbs with me. I’ll be teaching on it throughout the year on my Gospel Truth program. If you want to study ahead, the Complete Proverbs Package also contains the teaching on CD and DVD. Get one of these packages today. I know you’ll be blessed! Download full PDF of the January newsletter.